The National University of Singapore study's findings were based on 663 Chinese adults, aged over 60, whose diet and lifestyle were tracked from 2011 to 2017. Mild cognitive impairment (MCI) can make people forgetful, affect their memory and cause problems with language, attention and locating objects in spaces - but the changes can be subtle. Mushroom eaters performed better in brain tests and were found to have faster processing speed - and this was particularly noticeable in those who ate more than two portions a week, or more than 300g (10.5oz). "This correlation is surprising and encouraging," said assistant professor Lei Feng, the lead study author, from the university's department of psychological medicine. "It seems that a commonly available single ingredient could have a dramatic effect on cognitive decline. "But we are talking about a combination of many factors - tea, green leafy vegetables, nuts and fish are also beneficial." 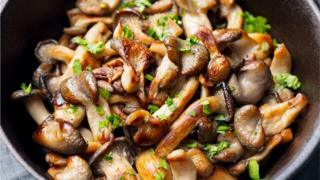 The researchers point to the fact that mushrooms are one of the richest dietary sources of ergothioneine - an antioxidant and anti-inflammatory which humans are unable to make on their own. Dr James Pickett, head of research at Alzheimer's Society, said: "There are lots of factors that contribute to the development of dementia and it's estimated that up to a third of cases could be prevented by changes in lifestyle, including diet. "Dementia is one of the top 10 causes of death, but people can take action to reduce their risk, so it's important that we base our advice on consistent evidence that's built up over multiple studies, and don't get carried away with the findings of any one single study. "So while eating a diet full of fruit and vegetables, including mushrooms, is a great starting point, our best advice is to also cut down on sugar and salt, be physically active, drink in moderation and avoid smoking." The study is published in the Journal of Alzheimer's Disease.